MIST Ice Tea Jug for cold-brew 64 oz. Make thirst quenching iced tea in minutes with the Mist jug with the Basket Infuser! Add hot water to the infuser filled with loose tea. After adding cold water, remove the infuser by the handle. Serve over ice and enjoy! Ideal for tea bags too! Detachable lid for easy cleaning! Dimensions: 7.5" wide with handle, 5.75" diameter base, 3.5" diameter top opening (w/o infuser) and 7.75" tall. - Dishwasher-safe, but hand-wash recommended for glass jug. - Only glass jug is microwave oven-safe. - Do not place tea jug directly on flame or heating element. 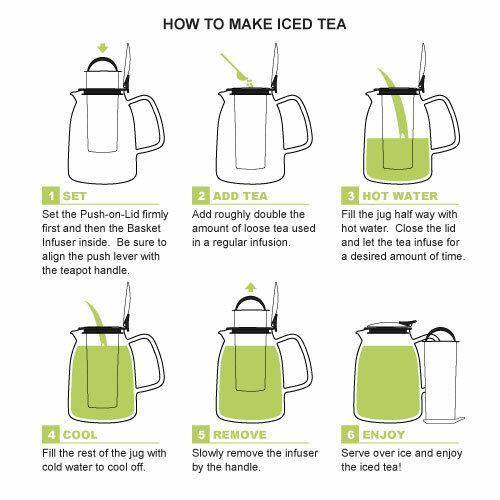 - Do not freeze tea in glass jug.